4K technology is quickly taking over the mainsteam of the digital video world, from TV screens to computer monitors to cameras and projectors, 4K screen resolution and all of its accompanying features are now no longer just bleeding edge technologies but becoming positively mainstream, particularly when it comes to TV displays and the video recording that creates their content. But, you might be wondering what exactly 4K is and what the different details behind it are all about. Well, we’re going to cover exactly that here and give you an overview of all the critical information about 4K ultra-high definition and other types of ultra HD resolution that you need to know as a potential buyer of TV, projector, camera and other display or recording technologies. 4K, most commonly known by its UHD (Ultra-High Definition) variant for TV and PC displays, is an overarching term that also encompasses several resolution sizes which offer more pixels than regular HDTV (at least 4 times more pixels and thus the name 4K). The ultimate result of this increased pixel breakdown is a an image clarity that goes well beyond conventional 1080 pixel HD resolution and presents more vibrant, varied and realistic colors as well as much higher frame rates. Currently, the most widely known type of UHD technology is the 4K resolution TV and many of these have been emerging on the market since mid-2013, although 4K monitors have been around since 2013 and 4K resolution film and photo cameras commercially since at least 2012. 4K display has to consist of at least 3,840 pixels (horizontal) x 2,160 pixels (vertical) of resolution and the horizontal can go above 4,000 pixels. This puts it on the top of the current scale of digital resolutions in which the bottom is occupied by standard definition TV (450X540 pixels), HD with 720 pixels and full HD at 1080p. In simplest terms, if you measure HD resolution by vertical pixel height (720p, 1080p) then 4K UHD can also be called 2160p. As you can see, 4K outstrips its best HD predecessor by a very wide margin in creating a resolution profile that’s two times wider and two times higher than 1080 HD, thus giving a total screen resolution that’s a bit over 4 times larger overall, thus its name, 4K ultra HD. Now, we’ve been using the terms 4K and UHD interchangeably so far and while they basically are interchangeable at the commercial level, they do actually also mean slightly different things. While most UHD that you’ll find on TV screens is actually 3,840 pixels as mentioned above, it still gets called 4K because it does after all offer 4 times the resolution profile of regular HD. However, in a more specialized context, proper 4K is what is most often found as a digital camera resolution standard that involves an actual 4,096 x 2160 pixel resolution at an aspect ratio of 1.9:1 (horizontal: vertical) as opposed to common TV based 3,840p width and aspect ratios of 16:9 or 1.78:1. Basically, regardless of the fact that 4K TV is officially defined as UHD, you’re buying into the same thing whether you see either 4K or Ultra HD used to describe a TV, monitor or film/Photo camera. While the origins of 4K film go back quite a ways and have their roots in theatrical releases of films such as Blade Runner: The Final Cut back in 2007, it wasn’t until James Cameron filmed his now famous “Avatar” in 4K resolution that the projection platform itself was widely introduced in many theaters eager to please audiences with beautiful crystal screen clarity. However, going from theaters to something like home entertainment is a big leap and it wasn’t until just within the last couple of years that both projectors and the already mentioned TVs became widely available for home theater system set up that would let consumers enjoy UHD clarity in their houses. Now, in terms of TV 4K systems, this resolution isn’t even entirely noticeable unless you enjoy a very large and thus very expensive screen or are sitting abnormally close to your TV. However, when it comes to projectors, the power offered by 4K really does become visible. Most 4K projectors offer at least 4,096 x 2,160 pixels of resolution and because they typically offer projection area sizes that totally dwarf all but the largest 4K TVs, this is where you really notice the difference between UHD and regular HD content. With a projector showing native 4K content or even upscaled 1080p HD content, you finally get to experience picture clarity in your own home that imitates on a smaller scale what you’d find with a large UHD public theater screen. While 4K content for home theater systems such as projectors and TVs is still pretty scarce on the ground, it is making ground as streaming content. YouTube has had a 4K channel running since as early as 2010 and other developments are definitely on the horizon, especially in countries or regions with excellent internet connectivity that goes above the normal speeds available to most people. The broadcast industry as a whole is offering the promise of a steadily more established standard in streaming content compression during transmission, called H.265 or HVEC (High Efficiency Video Codec). With the implementation of HVEC, broadcasters are assuring the buying public that 4K content will become easy and economical to stream into home theater systems and thus will become much more common. TV manufacturers themselves have been keeping up to date with this promise and have ensured that every new 4K TV to be released since 2015 and today, as well as for the foreseeable future, is fully capable of decoding the HVEC standard for its users. Furthermore, other competing standards of 4K video compression are being developed, though with less ecosystem traction. One that has gained some headway is Google’s VP9 4K video compression codec, which the company still uses in compressing the 4K content streams found on its YouTube video service. Most premium 4K TVs today are compatible with both VP9 and H.265, though not all models offer both. 4K TVs don’t just come with the benefit of enormously enhanced resolution. They include a number of other features that distinguish them from more conventional TVs. First of all, let it be clear that even if the difference in resolution isn’t too noticeable on a typical 4K screen size from a normal viewing distance, it is definitely there. The extra and much smaller pixels make a real difference whether your eye sight lets you notice them or not and additional features like ultra-high refresh rates and specialized technologies like enhanced colors, HDR technology and special motion rendering features (more on some of these below) will dramatically improve your viewing experience. Furthermore, buying a 4K TV gives you access to future connectivity specs and future visual specs that will come in handy as broadcasters catch up to the new technology. Also, the illumination capacities of most UHD TV brands use particularly powerful versions of technologies such as LCD panels illuminated by LED backlights in the form of local dimming or full array dimming systems that dramatically improve picture brightness and contrasts. Then there are also OLED 4K TV displays, which also exist for Full HD TV models but offer particularly spectacular picture quality and precision illumination in 4K UHD OLED TV models. If what you’re looking for is maximal image quality features –even if you don’t particularly care about 4K UHD resolution itself—the major 4K lines of TVs from major manufacturers also happen to offer the top of the line in terms of these other image enhancement capabilities and they offer them at prices that are steadily dropping to the point that they have now reached prices on par with those of many higher-end HD TVs. Finally, understand that 4K content is growing into the market as you read this. 4K film camera prices are dropping too and a lot of new content is being filmed and distributed based on this platform. Furthermore, new sources of 4K content via Blu-ray discs in ultra HD resolution is finally here in 2016 and movie titles are coming out at a steady pace in this new format. And as we’ve already covered above with streaming content, compression and transmission codecs such as HVEC are going to make sure that both 4K broadcasts and 4K home theater systems are mutually compatible for delivering UHD content even if bandwidth conditions for most homes don’t improve significantly. Moving along into some particular features of current 4K display features in TVs and other devices, we come to a few very particular specs and technologies which are redefining the quality of both the TV display viewing experience and how rich the consumer content experience can become. In particular, high dynamic range and wide color gamut are playing a crucial role in making 4K TVs into displays of previously unparalleled richness and quality. High dynamic range technology is the Big New Thing in the world of 4K TV displays and with good reason. What HDR essentially does is expand the range of both bright and dark levels a 4K TV can show on the screen. At the same time, highlights of color vibrancy and richness are also expanded by this same wider dynamic range. The result is a more realistic, much more sharply detailed picture quality in comparison to what you’d see with standard dynamic range (SDR). Of particular interest to TV makers (and consumers once they get to experience the realism produced) is the ability to develop HDR that can come as close as possible to simulating the brightness and darkness of the real world. Thus, while we already have 4K TVs that can create essentially “perfect” darkness with no notable light emission, in the form of OLED technology, the brightest consumer HDR 4K televisions, even for 2016, can only manage something between 1000 and 2000 nits of brightness, when in the real world, even the sky on a sunny day is seen by our eyes at about 20,000 nits. Thus you can see the dramatic difference at work here. However, the aim of 4K TV makers and the companies behind HDR technology is to create displays which can even reach 10,000 nits. This is what one HDR standard bearer called Doby Vision is aiming for. Current HDR standards like “UHD Premium” from the UHD Alliance call for at least 1100 nits of maximum brightness in LCD 4K TVs but more on that shortly. Another crucial aspect of modern 4K TV content is color gamut technology, or the ability to deliver the largest possible range of rich colors for the greatest possible realism and vibrancy. Currently, many 4K TVs are thus starting to offer color ranges that conform two two particularly broad gamuts called DCI P3 (which is frequently used in commercial cinematic display) and REC.2020, which is the current “Wide Color Gamut” gold standard for 4K ultra HD. However, not all 4K content fits these higher quality standards and much of the video and 4K TV display technology still on sale is REC.709, which was developed for older HDTV display technology. Color bit depth is also important in the race for Wide Color Gamut in 4K resolution video. Historically, most HD TV content and HD Blu-ray discs have all offered 8-bit color. Now, the newest 4K TV displays and the newest sources of 4K ultra HD entertainment, such as the 2016 4K UHD Blu-ray discs, are all offering up 10-bit color, for a much larger and smoother range of 1024 different RGB (Red, Green, Blue) color values and a greater degree of display realism. There are also plans in the works for 12-bit color, which would offer 4096 different RGB color values instead of the 1024 of 10-bit, or the 256 values of 8-bit color. As you can see, two extra bits equates to an exponential increase in core RGB color values. 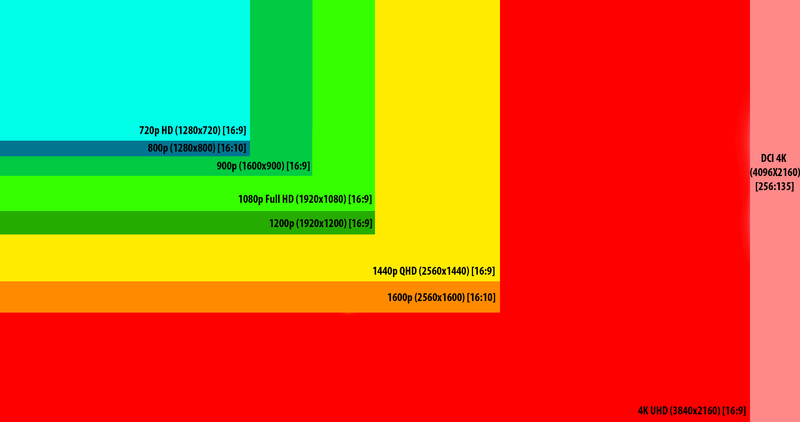 10-bit color for Wide Color Gamut is also a standard for “UHD Premium” certification in 2016 4K TVs. As we alluded to above, there are currently two main 4K display standards being pushed on TVs for both High Dynamic Range and Wide Color Gamut. These are called “UHD Premium” and “Dolby Vision”. The first is the more dominant for now and is being used in numerous 4K TVs from brands like Samsung, Panasonic, LG, Sony and others under the supervision of the UHD Alliance, which is a display technology and media industry consortium of companies which came to an agreement on what should constitute HDR, color and other specs in a premium UHD entertainment experience. Dolby Vision on the other hand has been developed by Dolby Labs and it also offers a standard for what HDR in particular should be defined as, but also includes provisions for Wide Color Gamut. Dolby Vision’s aim for 12-bit content color, 10,000 nits of brightness and a few other key changes though for now the Dolby Standard is a lot lower for practical reasons. Currently, only Vizio’s Reference Series 4K TVs and LG’s G6 OLED 4K TVs for 2016 offer Dolby Vision certification. Both Peak Brightness and deep black levels of either more than 1000 nits and less than 0.05 nits of black, OR more than 540 nits of peak brightness and less than 0.0005 nits of black level. (This dual contrast standard is likely a direct sop to LG’s OLED technology, which can’t match the high nit levels of LCD/LED displays but can completely outmatch them in terms of how dark their blacks go, thus re-bracketing the range which constitutes HDR and deep contrast. Black level of at least 0.03 nits or less than this. Conventional HDMI 1.4 can handle 4K TV, but only up to speeds of 30 frames per second. Unfortunately this is still a common standard on many 2013 4K TVs but that’s changing and the latest TV models as well as the latest 4K projectors and computer monitors will all be outfitted with HDMI 2.0 ports, which are designed to handle the much higher frame rates and bit depths of UHD content. Furthermore, most 2016 4K TVs now come with the new HDR-capable HDMI 2.0a connectivity standard, basically identical to HDMI 2.0 but with the ability to also transmit metadata for high dynamic range content. Many 2015 ultra HD television models have also been updated with firmware for HDMI 2.0a. So the bottom line for HDMI is: buy a TV, monitor or projector that’s already been outfitted with HDMI 2.0 and if possible HDMI 2.0a and you’ll be perfectly fine for the next generation of 4K content ad well as existing sources. What About Regular HD Content on 4K Screens? This is one of the key questions around the question of buying into 4K TVs and projectors. (Particularly TVs though, since they’re far more affordable). And the answer is a resounding Yes! Almost all of the latest 4K TV models will not only easily play 1080P HD, 1080i, Blu-ray, HD DVD or even 720P content but will also upconvert any of these formats so that they’re rendered more clearly in UHD. Now while there is some debate on just how visibly your conventional content improves with this upscaling technology, it does indeed get rendered more sharply and especially so on the higher end TV brands with much more powerful upscaling engines running inside them. Thus, the bottom line is that yes, your TV will display and even improve conventional HD content of all types but you should be sure to buy a make and model of TV (or projector) whose upscaling engine is widely considered to be superior. Should I Buy into 4K? If you want a video or photo camera that will deliver image and film clarity like nothing you’ve ever created before, then yes, you should buy a 4K camera. If you’d like a home theater projector that’s ready for the arrival of 4K films and streaming content, then yes, go for 4K, though it will still cost you at least several thousand dollars to get your hands on one. If you’d like a computer monitor that can render the latest games and UHD web content in the clarity they were designed for, then you should definitely get your hands on a 4K monitor. This applies even more so if you’re a professional designer or architect who’s involved in work that requires extremely detailed rendering of graphics. And finally, in terms of the most dominant 4K product on the market today, the TV, then if you want to future proof your set for viewing the wide array of 4K entertainment options that will definitely be appearing in the next year or two, you should buy a UHD TV screen from a high quality manufacture and the latest standardized specs likfe those we’ve covered in previous sections. Even if 4K content is slow to arrive in your area, you’ll at least benefit from a wide array of top of the line resolution upconverting, rendering and display technologies which will drastically improve all of your regular HD content much more beautifully. What’s the Bottom Line, Is 4K Here to Stay? This certainly looks to be the case. Current 4K UHD trends are developing at a much faster and steadily more affordable pace than what we’re seeing with plasma TV and the still incredibly expensive OLED display technology. In fact, plasma TVs, which for a time were thought to be the next wave in Ultra HD TV display technology are failing completely so far. With Their main manufacturer having ceased production this year. This means that 4K is almost certainly going to have its large space on the TV market as new UHD content emerges, and the technology is already well established as the latest and possibly best in cameras and film projectors. Yes, major manufacturers are already working on experimental development projects in the even more powerful 8K resolution technology but many of the problems that already exist with displaying and streaming 4K will need to be worked out even further before 8K ever becomes a commercial product. So for now, it seems that 4K is here to stay at least for the next few years and getting ready for it is a great idea now that prices for TVs, cameras and even projectors are dropping. Amazing !!! Superb ; One could appreciate the Hue of Colors in their fineness . It is something fantastic and enthralled me and hope the same of any one viewing 4 k RESOLUTIONS. 4k is only marketing push of new products,still not exist 1080p broadcasting without compression and we cannot feel all benefits of it, but for manufacturers exist only one way to sell what we are really do not need this time. If “4K” meant four times the pixels, wouldn’t it be called “4X”? Seems more logical that 4K means 4000, as in if you rounded 3840 up, or rounded 4096 down. It’s “Blu-Ray” not “Blue-Ray”. You seem to go back and forth on this. It’s “upscaling”, not upconverting. Your entire article is biased towards the purchase of new equipment. To all who read this, do not make a purchase based off of only this article. Do not listen to the sales person either. Research. We call it 4K because that is the name of the DCI format. The dimensions are 4096×2160. The other DCI format is 2K – 2048×1080. In cinema, the width stays constant, and differing aspect ratios are accommodated by adding black padding to fill the 2K or 4K container. 4K was brought into the mainstream via advancements in the digital cinema realm (like cameras) that were popularized, so the terminology carried over. What most people know as “4K” right now is also known as UHD, continuing from the HD/Full HD terminology. Dimensions are 3840×2160 for a 16×9 aspect ratio. Jesus christ people have a hard time grasping basic stuff. 4K in 16 by 9 aspect ratio is 4096×2304 not 4096×2160 and certainly not as Stephan Jukic states 3840×2160!!!!!!!! And 8K is 8192×4608. Basic math. JHC, Plenty of UHD monitors and also 4K TVs exist which come with a 16:9 aspect ratio and a 4K UHD resolution of 3830 x 2160 pixels. We’ve seen them, we’ve reviewed them and a quick visit to the manufacturer sites and their own specs can quickly show you that these specs are indeed the case. As for DCI 4K resolution (4096 X 2160), it actually commonly doesn’t have a 16:9 aspect ratio and instead uses a 1.9:1 ratio and 4096 x 2304 RAW ratio is commonly 16:9 as well. in that you are finally correct, as far as video itself goes. We were focusing more on the ratios and resolutions for TVs and display devices. As for 8K resolution at 8192×4608, well no. not really, the standard defined resolution of 8K UHDTV (4320p) is 7680 pixels wide by 4320 pixels tall. Your math is not in accordance with the actual practical ratios and resolutions as practiced in the display industry itself. I don’t have cable or anything. I use an antenna for local channels and watch a lot of Netflix. Would buying a 4k be a good idea or just stick with the 1080p. Looking at a 65″ tv. I don’t have cable, dish, or any of that. I use an antenna for local channels and watch mostly Netflix. I don’t plan on upgrading my netfix to get the 4k options. Would I still benefit from buying a 4k curved tv? Hello there Dan, actually yes you would benefit from a 4K TV. With high quality modern 4K ultra HD TVs and especially those from the major brands Samsung, Sony, LG and Vizio or Panasonic, the quality of the display technology is about a lot more than just resolution. For one thing, all of these TVs (but particularly the Sonys and Samsungs) offer excellent upscaling engines which really do make HD content look a lot better on their screens and secondly, these TVs often provide both enhanced color and contrast ranges which work even at making high quality HD video look better than it would on a normal HDTV. These factors also depend of course on how well mastered the original content was but for quality HD content, it definitely looks better on a 4K tv than your average 1080p TV. I have a question. If I watch a 1080p movie on 1080p TV (Or 4K movie on 4K TV), on my computer that has a 720p display, so is it run as 1080p (Or 4K) or just as 720p? PS: My computer can run a 1080p and 4K movies. Sorry, but you are wrong on one thing on your chart: 3840 x 2160 is *not* quad HD. Quad HD is 720p x 4 which is 2560 x 1440, or 1440p. This is often referred to as QHD. However, 3840 x 2160 (Still not actual 4K) is called Ultra HD (Which you mention elsewhere in your article) because it is 4 x Full HD (1080p). I think the correct term, rather than “4k,” should follow the standard format of 3840 x 2160, as established by the parameters of HDMI 2.0 & Displayport 1.2 — which is 3840 x 2160 Progressive (lines) @ 60 Hz. — and simply be termed “2160p” or perhaps “2k,” rather than UHD (Ultra High Definition; a.k.a. Ultra HD). Since “1080p” or “Full HD” was based on the same standard of 1920 x 1080 Progressive (lines) @ 60 Hz. as HDMI (v1.0 – v1.4) and Displayport (v1.0-1.1); especially since we never referred to the 1920 x 1080 standard as “2k,” even though there were also varying terms for that one as well. Since society has become more familiar with the Vertical term, such as 1080p, rather than the Horizontal, such as 1920p, I still believe the most accurate should be “2160p.” Seriously?!?! How is that not logical?!?! How is that not the correct term?!?! Am I the sane person in Earth who get this?!?!? Thanks for posting your article, very interesting to read about the technical aspects of 4K and UHD! Last week we bought a Samsung 4K UHD television and after reading your article I now understand more about what I really bought and what is producing this impressive quality. The image quality (even with lesser HD quality broadcasts) is beyond what I have ever seen, it is really very, very good. I like all the 4k nudie flix out now. Go 4k! One of the very few accurate articles on the web about UHD, and one I can contribute to without making massive corrections. You described the upscaling and how TVs with good hardware and software construct transition data that greatly improves image quality. The common argument against UHD is if you sit at the recommended viewing distance, a 1080P image and a UHD image will both will appear to be of equal quality due to the limitations of the human eye. However, you could make the same case for 720P. There are some other very tangible advantages in addition to what has already been said. 1. Because of the image quality improvements caused by upscaling/creating smoothing data on the fly for 720P and 1080P to UHD, you can sit much closer to a large screen TV and still have a great image. That is documented by the bottom of the viewing range being 1/2 what a 1080P screen TV of the same size would be. 2. Conversely, the far end of the recommended viewing distance for an UHD is also 1/2 the distance of a 1080P for a given screen size. The only reason for that is because text size under UHD is 1/2 the size. However, if you send the TV a 1080P signal, you now have a TV that will have good picture quality near, far, and text, such as when browsing, will not be too small. Of course there is no problem with running native UHD content as well. 3. From my own experience, UHD TVs generally provide brighter images, with better contrast, and better off-angle viewing. Combined with 1 & 2, you can see that buying a UHD TV greatly increases the flexibility of the TV placement and seating in the average living rooms. These advantages present a clear value proposition for justifying UHD. The tiger is 8k :/ before writing about 4k learn what it is. Just going by the chart above, 4K should be the max we will ever need. I don’t see how the average person will get any significant benefit from 8K; you’d either need to be sitting closer than 5 ft. from your TV, or the TV would have to be over 80 inches. So, c’mon manufacturers… just stop now and focus on quality. The title is wrong, “Everything You Need to Know” includes the date of when this was written / last updated but I can’t find that anywhere. can you please name future resolution ”8k” as HyperHD ? I am 100% positive that you used a picture that is completely incorrect. I made a new image, you can use it to replace the error. Thanks Sterling, the image is quite old and we’re in the process of updating the page as well. Would you like a name credit for the image? Simply this is a new way to steal money from our pockets. Love how the article uses the chart which basically shows most people still don’t even benefit from full HD and a HDready tv would be mroe than perfect, yet suddenly mysteriously 4K would get noticed? So now we can buy a 4k tv, while as many already said there is no true 4K material out there via streaming, barely any 4K blu-rays and with consoles the XBO and PS4 will hold their 4k brothers on the ground, since they won’t be making textures for 4k since the older versions won’t be able to use them and would only strap them further to the ground. Unless you believe they will create a seperate texture pack on the medium for people who will play on the 4k counterpart. And this all ‘again’ for something people won’t see from a ‘tv viewing’ distance. Great for PC Gamers and great if you have this screen only 1-2 meters away from you, but a waste of money for the average household. This is a very interesting guide (and comment section. I’m trying to figure out what TV I should buy next. I was under the impression that this is 4K, which seems to agree with what Sterling said, but others on the comments disagree (saying it’s ultra HD). So which is it? For those of us not in America, UHD TV’s have one big disadvantage. They use FIXED screen refresh rates of 60Hz or occasionally 120Hz. So all our nice 50Hz video gets interpolated to 60Hz video. Not good. By comparison HD screen displays vary their refresh rate to match the incoming source video. One reason I’ll be sticking to HD over UHD. I have been reading through your article , compare 4k vs 1080p and found it extremely interesting, however I am still confused with my particular decision. I currently have a panasonic 1080p TV, operating via a standard roof aerial , I am looking to purchase a 43 inch samsung smart 4k ultra hd, however I am now being told that unless I upgrade to a satelite dish, or similar my viewing experience would not be improved or could be even worse . Now that does leave me with a problem, can you help ? My wife and I prefer our $550 2014 Sony 48″ 1080P to a recently purchased 2016 Samsung 55″ 4K UHD (at double the price of the Sony). Each of our 3 previous purchases of an HD set was an immensely satisfying experience–a bigger screen and better picture at less cost. But after all the hype (even from “trusted” CR magazine) the new UHD set is an anticlimax if not a disappointment. I’ve even tried to access 4K content from Amazon and Netflix by using a Fire TV and Roku box rather than the Smart TV feature–but the “wow” factor just isn’t there. Perhaps part of the let-down is due to my “senior” eyes or to the extra distance (5-6 feet) away from the new screen. Or perhaps it’s my Time-Warner broadband. Whatever the case, to my eyes 1080p vs. 4K is all about technology and theory and has little to do with the empirical evidence registered by the human eye.